Golfing in Minnesota can be a grand experience—a great walk unspoiled in the beauty and temperate climate of the area. But, like anywhere else, it can have its moments. There are cold and rainy conditions every spring, yet the golf courses are still open. You just have to be prepared—so here are some tips for playing golf in cold and wet conditions. Dress for Success: When it’s cold and wet, we all want to be warm and dry. Pretty simple, right? Well, it starts with waterproof pants and a decent pullover to keep your core warm and flexible. Layers and warm clothes are the way to go for a golf outing. Plus, bringing a hat that will deflect rain and perhaps something to keep your ears warm in colder temperatures will help you ignore the conditions and concentrate on your game. Throw in the Towel: At the minimum, you should have two towels—one for keeping your hands dry and the other for wiping mud and water off your clubs. Have a third one (or more) in a plastic baggy in your golf bag when one of the first towels gets soaked beyond usefulness. Also, now would be the time to use that cumbersome umbrella you always bring along but never use. The more time spent under it, the dryer you stay. Warm Hands—Good Scorecard: Gloves and hand warmers will help with your round. Once completely wet, golf gloves can become slippery and useless, but there are some on the market that are better for wet weather than others. Regardless, have some spares and keep them dry. Hand warmers are necessary if the temperatures warrant them, and they can be crucial. Cold hands will lessen your feeling on the clubs and effectiveness just about anywhere on the course. A Warm Tool is a Happy Tool: Now that you are relatively warm and dry, you have to do the same for your equipment. 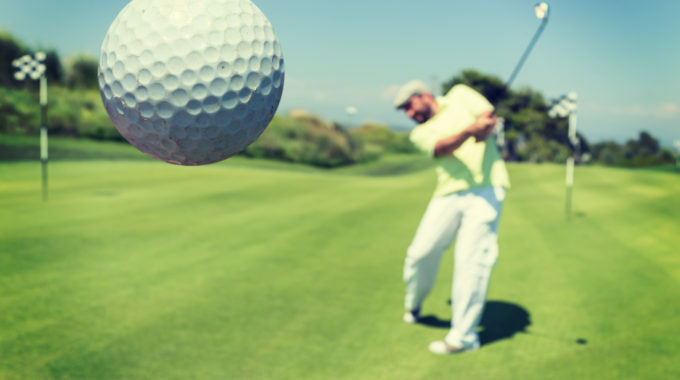 Golf balls reportedly travel about 3-5 yards less (depending on air density) with every 10 degrees drop in temperature. So, keep your golf balls in your pocket between holes so they stay warm. In addition, you might want to exchange clubs prior to the round to make up for the affect of the conditions on your equipment. In some cases, replacing long irons with hybrids or fairway metals is worthwhile. Long irons can be tough in any weather, but the wetter it is, the more trouble they may present. The hybrids will give you more loft due to a lower center of gravity, and they may be just the thing to nip a shot off soggy ground. Mind over Matter: Finally, the mental game really comes into play in tough conditions. Know the rules – winter rules, lift clean and place, relief from casual water, etc. – they can help in the wet and cold. Recognize the conditions and accept them. The shorter distances the ball travels means don’t think that your normal 150 club is going to be enough. Shelve the ego and club up. Solid contact is the key and over-swinging can be disastrous. Watch what the weather is doing to shots. The ball will not roll on wet fairways and the wind will certainly affect shots, maybe even some putts. On the other hand, because of the conditions, you can be bolder with your chipping and putting. Always give it enough to get it to the hole. Above all, stay mentally in the game. If you want to be out there in tough conditions, because it’s your only chance to play that week, then make the most of it by staying focused and in the moment. It can always make for a good golf warrior story to tell.